Every single day, I get a multitude of emails with a very general question: how can I build muscle? It often times leaves me stumped, analyzing the computer screen with a blank look on my face. Not because it’s a difficult question, but because despite it being the biggest question I’ve set out to answer – I haven’t. 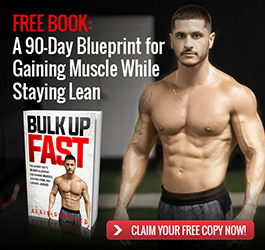 Today I plan to, once and for all, give you the blueprint for not only building muscle, but ensuring that you’re continuing on the right path, long after exhausting your newbie gains. Anyone can gain muscle in the beginning – go to the gym, consistently, and eat – but when that hyper-sensitive stage is over, how do we continue to grow? 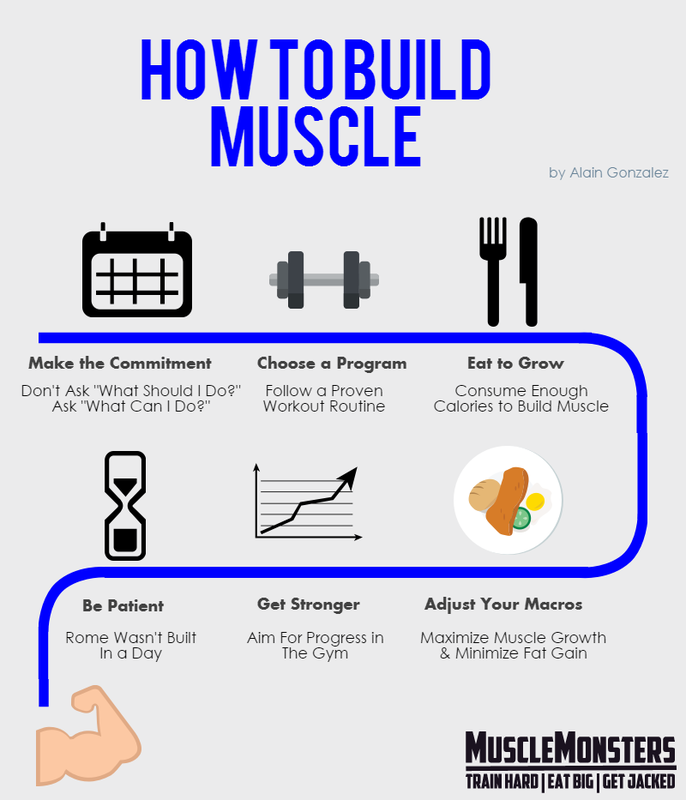 The formula for building non-stop muscle mass, when it comes down to it, can be broken down into 6 fundamental steps. 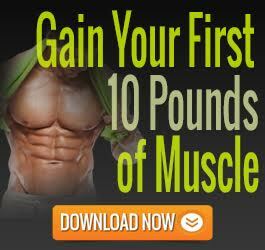 At first glance, this may seem like an oversimplification of the muscle building process – and it very-well may be – but if you can manage to follow this outline, step-by-step, you’re guaranteeing the development of new muscle tissue, period. Over the years, I’ve seen friends come and go…to and from the gym, that is. What typically starts out as excitement and determination, almost always ends up as disappointment and failure. In a recent survey conducted with the reasons why people quit their gym membership, 30% of respondents said they weren’t using it (their membership). We can speculate as to why they weren’t using it, but I think it’s safe to say that anyone who just quits, is not committed. One might say that it’s due to a lack of motivation, and this may indeed be true, but dictating your actions based on emotions, alone, is setting you up for major failure. This is, in part, due to decision fatigue: a theory that suggests that the simple act of making a decision depletes us of willpower. Going to the gym isn’t just about money or time, it’s about making the decision, each day, to get in your car and head to the gym for a given amount of time. When going to the gym is no longer a choice, but a commitment, you’ll never have to rely on willpower, which is limited, ever again. Success in anything, from fitness to business to marriage to friendships, all boils down to one thing: commitment. Motivation comes and goes, commitment is forever. If you’re committed to the goal of transforming your physique, then dedicating yourself to your training comes naturally. Commitment is a necessary step for success, but showing up, alone, won’t get you jacked and ripped. This is why it’s critical that you choose a solid, well thought-out, proven program. Whether you’re new to lifting or a seasoned vet who can make his way around the gym with his eyes closed – the better the program, the better the results. But what good is a program without adherence, am I right? This is why, when choosing a program, you must not only consider how effective the program is, but how realistic is it that you adhere to it, too. So before choosing a program based on whom it’s designed for (i.e. beginners, intermediates, or advanced) or how much muscle your friend gained from it, you must first ask two very important questions. 1. With my current schedule, can I, realistically, adhere 100% to this program? 2. 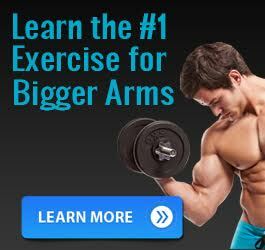 Does this program get me primed and excited to get up, each day, to hit the gym? Although you’re dedicated to your program, whatever it may be, if it doesn’t fit your schedule, it’s not realistic to expect 100% adherence. And commitment, alone, may be enough to get you out of bed and to the gym – but it doesn’t guarantee that you’re super pumped and performing your best. Let’s imagine you had two choices to choose from – one is an “optimal” 4 day split, the other is a less-effective, 3 day full-body routine – which would you choose for best results? The answer may seem obvious, but it is far from it. Due to your schedule, you’ve only got 3 days in which you’ll have time to hit the gym – adhering to the “optimal” workout is unlikely. Let’s not forget, the 4-day split is an upper-lower routine and it’s not exactly something you enjoy. Do you still think the “more-effective” split is, in fact, more effective for you than the 3 day full-body split? The fact that you can adhere to a 3-day training schedule, alone, is more than enough to yield better results than a better program with less adherence. Match that with a training style that you enjoy, and you’ve got a powerful program – one you would have, initially, disregarded because you chased the word “optimal”. Step 3 – Eat to Grow! 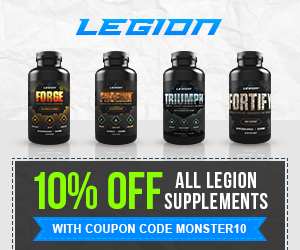 Stimulating the muscle enough to grow is one thing – ensuring that the necessary nutrients are available for recovery is another. As a beginner, you may be able to get away with mediocre eating habits – but 1) you won’t be optimizing that special opportunity and 2) that phase will pass, and you’ll end up stuck and spinning your wheels like a truck tire with no grip in high mud. This is why it’s critical that, if our goal is to build muscle, we take in a surplus of calories. If we are eating more calories than we are expending, we are ensuring that we’ve got the necessary resources available to repair and rebuild new muscle. Failing to do so will result in nothing more than wasted time and energy. I’ll put it frankly: I don’t care how hard you’re training or how flawless your adherence – if you’re not eating enough, you’re not going to grow. I don’t care how hard you’re training – if you’re not eating enough, you won’t grow. If you are a male with a healthy metabolism who exercises regularly, then the number 16 is a great place to start. In most cases, this caloric intake will put one at maintenance. For others, this will suffice for building muscle, maximally. The least likely outcome is that you’ll be undereating. Either way, though, it’s simply a starting point. 1. Weigh yourself every morning for an entire week while adhering to the prescribed calorie intake. 2. Get an average of your weigh-ins for that week. 3. Weigh yourself every morning for another week while adhering to the prescribed calorie intake. 4. Get an average of your weigh-ins for week 2. 5. Subtract the week 1 average from the week 2 average. If your average weight has gone up, you’re eating enough to build muscle. If your average weight has remained the same, you’re at maintenance and should increase your calorie intake by 250-500kcal per day (and repeat). If your average weight has gone down, you’re undereating and should increase your intake by 500kcal (and repeat). Eating enough to build muscle, alone, is a great start. The next step, however, is to adjust the macronutrient distribution of those calories to ensure we are gaining more muscle and less fat. Alas, failing to do so will result in faster fat gain, poor nutrient partitioning, and ultimately, less time in a lean mass phase. The longer we can remain lean during our overfeeding phase, the more time we can expect to spend building muscle. Protein: When you consume protein, your body breaks the protein molecules in the food down into amino acid, and then uses them (the amino acids) to build its own proteins. If you don’t consume enough protein, your body may not get enough amino acids to build and repair muscle. Another study found a similar conclusion, but suggested that a higher intake may be beneficial depending on a number of factors. Numerous interacting factors including energy intake, carbohydrate availability, exercise intensity, duration and type, dietary protein quality, training history, gender, age, timing of nutrient intake and the like make this topic extremely complex. With all of that in mind, I would recommend somewhere between 0.8-1g of protein per pound of bodyweight. Fats: Fats can be unsaturated or saturated and help maintain overall health. How Much Fat: The Department of Nutrition and Exercise Sciences at Oregon State University concluded that somewhere around 20-35% of our energy intake should come from fats. This could be broken down to, roughly, 0.3-0.4g per pound of bodyweight. Plenty of other research noted similar findings. I recommend starting at about 0.3-0.4g of fat per pound of bodyweight; however, if a higher fat intake is warranted for better adherence, go for it. Just note that fats are more efficiently stored as bodyfat when overeating than both carbohydrates and protein. Getting too many of your daily calories from fat may result in faster fat gain during your overfeeding phase. Carbohydrates: Sugars, starches and fibers found in fruits, grains, vegetables and milk products. They’re also the body’s primary source of energy. How Many Carbs: According to some research, 45-65% of our daily intake should come from carbohydrates. Unfortunately, dictating your macronutrient intake by percentages is just not ideal. Fortunately, however, because we know exactly how much protein and fats we need, it wouldn’t take a mathematician to allot the remaining calories to carbohydrate intake. As I implied, once you’ve calculated your overall caloric intake, figure out exactly how many calories you’ll be getting from both fats and protein. Whatever calories are left over will make up your carb intake. Your primary goal as someone looking to build muscle is to get stronger, period. When we introduce a stress, our body is forced to adapt by building new muscle in hopes to handle the given stress in the future. If we fail to increase the stress, our body will find no need to repair and/or grow. This is why progressive overload is the most critical pathway to building muscle mass. As long as we can continue to add stress, over time, we’ll be forced to adapt and grow. The best way to achieve this is to increase the weight used without sacrificing volume (sets and reps). Another viable option would be to increase the volume (reps) without sacrificing the intensity (weight used). If you’ve been lifting for less than 12 months, simply adding a bit of weight to the bar – or keeping the weight the same and doing more reps – is a viable option. As you get more advanced, a non-linear approach where you’re undulating the rep ranges and intensities may work better. Ultimately, the goal should be to get stronger. The stronger you get, the bigger you’ll grow. It takes effort, persistence, and a hell of a lot of time. If you can learn to accept that the muscle building journey is a long one, you’ll have a much better chance at success. This is especially true once we’ve exhausted our newbie gains, and new muscle growth begins to come slower than molasses. And even slower than that after a few years. Trust the process and enjoy it. Rest assured that if you’re committed, eating enough, giving yourself enough time to grow, and getting stronger – you’ll end up with a physique you can be proud of. One that will showcase the time and effort you’ve put in. The permanent suit of armor that tells everyone you come across, “I am a warrior”. 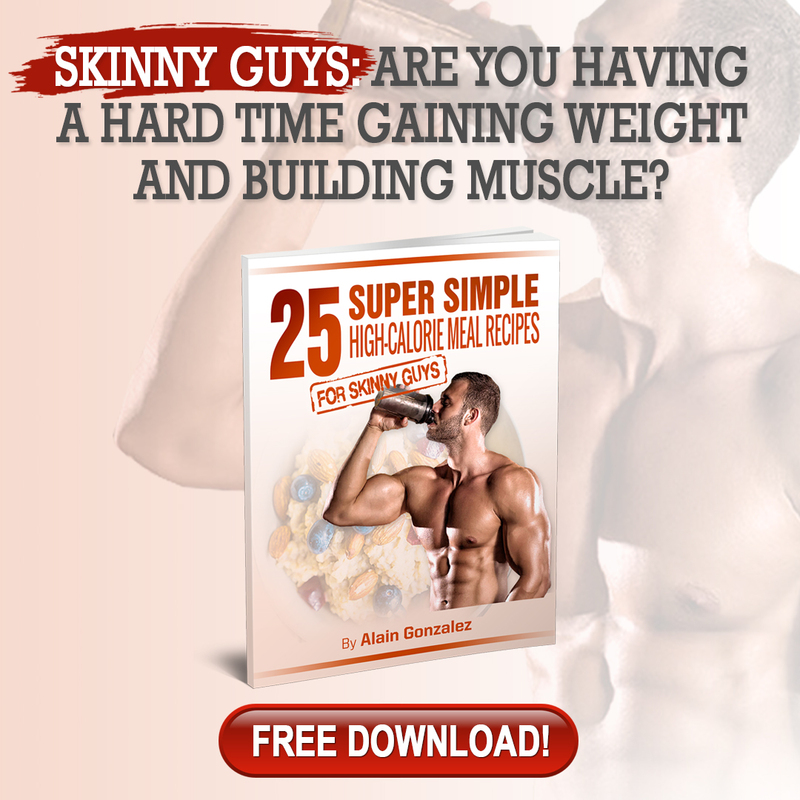 What you have here is a fail-proof, step-by-step guide to building muscle. You can choose to mark this as a notch under your belt of articles you’ve read, or you can take action – the choice is yours. I’ve provided you with all of the information you’ll need to ensure you’re on the right track, the only thing left now is that you put it to use. Did you find this helpful? If you did, make sure to give it a thumbs up and share it with your friends! Have any questions regarding this article? Leave them in the comment section below! No question will go unanswered.